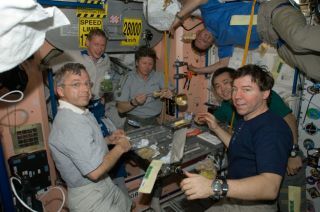 The International Space Station's Expedition 20 crew, the first-ever full six person team, share a meal in the Unity node of the International Space Station. This Fourthof July weekend will be filled with dazzling fireworks displays for manyAmericans, but not for NASA astronaut Michael Barratt, who is flying high aboveEarth on the International Space Station. Barratt is theonly American on the spacestation?s six-man crew, which includes two Russian cosmonauts and astronautsfrom Japan, Canada and Belgium. But while astronauts can see an amazing amountof detail on the Earth from the station?s unique vantage point, spotting thetraditional U.S. Independence Day fireworks is not among them. ?It?sbeyond the capability of human eye apparently to see manmade fireworks from orbit,?NASA spokesperson Kelly Humphries told SPACE.com. ?It?s 200 miles away,you know.? The spacestation orbits in the Earth at an altitude of about 220 miles (354 km). It caneasily be seen as a bright, fast-moving light in the night sky by the unaidedeye. NASA said this Fourth of July weekend will offer many Americans a chanceto seethe station for themselves if weather permits. SPACE.com?s SatelliteSpotting Guide has full details. From itsorbit, the station is close enough to Earth that astronauts can spot thepyramids of Egypt and large ships on the ocean, but too high up to see Fourthof July light shows. The station?s most recent American skipper Michael Finckeof NASA said he was unable to spot the trademark New Year?s Eve fireworks thatmarked the start of 2009 around the world, Humphries said. Fincke commanded thestation from October 2008 to last April. Lightning,which astronauts can see flashing in clouds during thunderstorms, can make fora natural stand-in for artificial fireworks, Humphries said. Fireworks andother open flames are not allowed inside the station?s main cabin as a safetymeasure, though astronauts canlight fires inside a special sealed box as part of an ongoing science experiment. Manymanmade structures are visible from Earth orbit, among them cities, highwaysand some of the vehicles that traverse them. The GreatWall of China is visible from orbit, but can be an elusive target since iteasily blends in with the background scenery when seen from the space station, astronautshave said. Former NASA astronaut Leroy Chiao listed his view of the Great Wall asone of his 10favorite photographs from the more than 24,000 images he took whilecommanding the station?s Expedition 10 mission between 2004 and 2005. No humanconstructs are visible from the moon, which is about 238,900 miles (384,402 km)from Earth on the average. While Barrattmay not get a chance to see fireworks, he will be able to spend some time withhis family through a video or radio link, Humphries said. The father of fivefrom Camas, Wash., and his fellow station crewmates will have some freeoff-duty time to contact their respective families or rest this weekend inaddition to their regular schedule of station cleaning, exercise and planningconferences. ?They?vegot time off to enjoy the day,? Humphries said.